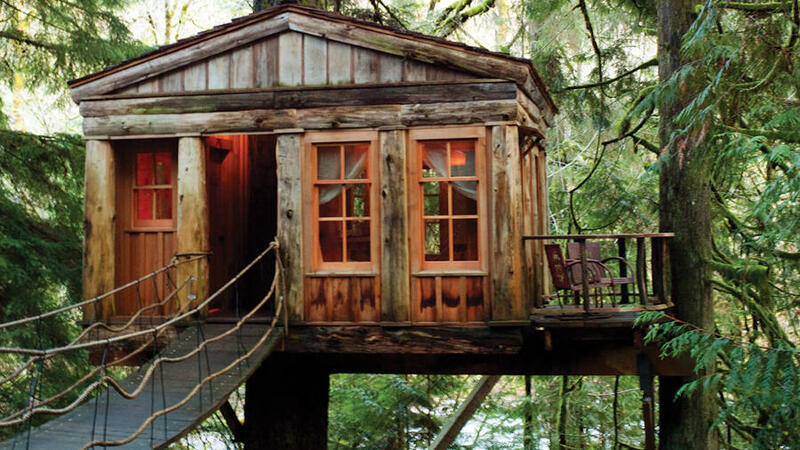 There’s a certain Neverland allure between nature lovers and treehouses. Maybe it’s the idea of sleeping tucked beneath a canopy, or a means of re-living an unquenched childhood dream. Whatever the case, treehouse rentals can undoubtedly spice up a weekend getaway. Given the West’s variation of redwoods, sequoias, and live oaks; travelers have a solid selection to choose from, including three of these stylish spots. Burlingame, CaliforniaAbout 18 years ago, contractor and treehouse builder Doug Studebaker began constructing this whimsical, sky-high retreat. Over the past four years the treehouse transformed from a kid-friendly slumber party spot to a vacation destination. Nestled into a majestic coastal live oak, the Studebakers’ treehouse harbors two beds, sleeps four people, and also features a rope swing and wrap-around deck, where guests can soak up views of the bay. Just 20 minutes from San Francisco Doug and his wife, Linda, have hosted guests from all across the world, offering a unique, urban forest experience via Airbnb. Stained glass artist Randy Beaver built this spacious tree-laden home about ten years ago. Since then it’s become a featured Airbnb attraction for nature enthusiasts eager to stay in intimate proximity to the Santa Cruz Mountains. Constructed between a family of redwoods, this vacation rental presents guests with a walking bridge onto the home along with a full kitchen, bathroom, and living area. Far beyond the standard treehouse, the Fogship Beaver is nothing short of a stunning home on stilts. Those settled closer to the Pacific Northwest will enjoy the magical grounds of Treehouse Point. Situated in lush forest of Washington this retreat center is home to six different treehouses–each crafted by world-renowned treehouse builder and author Pete Nelson. These incredibly, inventive designs come with well-kept living and sleeping quarters, as well as ground-floor bathrooms and a communal dining and lounge areas within the Main Lodge. The Crystal River Treehouse may not be technically housed in a tree, but it’s pillared, forested location makes it a worthy treehouse in my book. David Rasmussen and Steven Novy of Green Line Architects constructed the creative structure in Carbondale. The mini house is decorated with multiple beanbags, lounge chairs and floor-bound bed with a range of windows to enjoy the view. Unfortunately, the space isn’t available to guests, but given its one-of-a-kind character, it’s worth a momentary marvel.